Federal prosecutions for financial institution fraud have continued their downward slide despite the financial troubles reported in this sector. 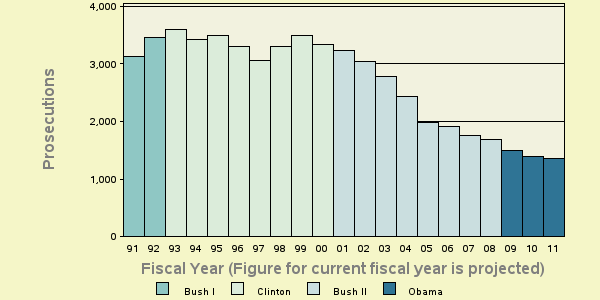 The latest available data from the Justice Department show that during the first eleven months of FY 2011 the government reported 1,251 new prosecutions were filed. If this activity continues at the same pace, the annual total of prosecutions will be 1,365 for this fiscal year, down 28.6 percent from their numbers of just five years ago and less than half the level prevalent a decade ago. See Table 1. The comparisons of the number of defendants charged with financial institution fraud offenses are based on case-by-case information obtained by the Transactional Records Access Clearinghouse (TRAC) under the Freedom of Information Act from the Executive Office for United States Attorneys. The long term trend in these prosecutions over the last two decades is shown more clearly in Figure 1. The vertical bars in Figure 1 represent the number of financial institution fraud prosecutions recorded each fiscal year. Projected figures for the current fiscal year are shown. Each presidential administration is distinguished by the color of the bars. To view trends month-by-month rather than year-by-year, see TRAC's monthly report series for the latest data. In terms of the sheer numbers, the U.S. Attorney offices during FY 2011 criminally prosecuted the most cases in the Southern District of Florida (Miami) with 84 defendants charged. The Southern District of New York (Manhattan) followed with 71 defendants, followed in third place by the Western District of Washington (Seattle) with 50. At the other extreme, six out of the country’s total of 90 districts filed not a single case. These districts showing no activity were the Southern District of Indiana (Indianapolis), both the Middle (Baton Rouge) and the Western (Shreveport) Districts of Louisiana, North Dakota, the Eastern District of Oklahoma (Muskogee), and the Northern District of West Virginia (Wheeling). Federal districts over which U.S Attorneys preside vary widely in size. After adjusting for population differences, the Southern District of Alabama (Mobile) rose to tie with Manhattan for first place on its relative volume of prosecutions. Mobile was also higher relative to population size than in Miami which dropped to third place. Table 2 shows the districts in the top 10 once adjusted for their varying population sizes. subscription or purchase is required to view the complete linked report. Somewhat surprising were the low rankings this year for some districts once adjustment is made for population size. For example, Massachusetts came in 74th out of 90, Nevada tied for 75th place, and the Northern District of California (San Francisco) was in 78th place. The lead investigative agency for financial institution fraud prosecutions through August 2011 was "Justice - Federal Bureau of Investigation" accounting for 37.6 percent of prosecutions referred. As shown in Figure 2, additional agencies with substantial numbers of referrals for financial institution fraud were: Homeland Security - Secret Service (32.5%), "Postal Service" (12.9%), "Homeland Security - Immigration and Customs Enforcement" and the Internal Revenue Service (3.9%).